PHOTOGRILL: Why did you shoot this photo? PHOTOGRAPHER: It was just due to the inspiration of seeing beautiful big moon rises in the past. We’ve all had that experience of marvelling at the golden moon rise and how large the moon looks close to the horizon. An interesting thing I discovered while trying to shoot this picture is the moon is more or less the same size when it’s close to the horizon as when it’s overhead. If you photograph it with a 1200mm lens in both locations the moon takes up the same space on the image. My guess is that our brain’s visual processing expects the moon to be smaller when it’s close to the horizon. We expect anything near the horizon to be further away. This large moon effect can’t really be captured directly by the camera, so my plan was to photograph the moon close to a landmark to give it a scale effect. 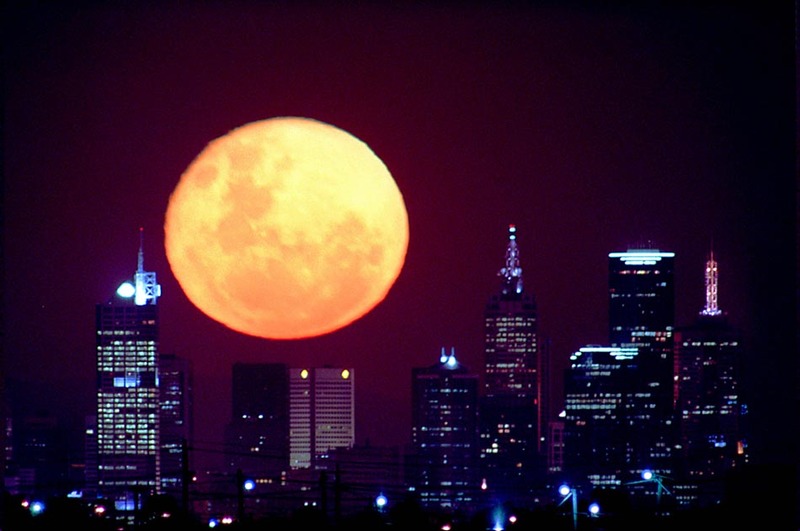 PHOTOGRILL: How did you know the moon would rise behind the city skyline? PHOTOGRAPHER: I called the Melbourne Planetarium. Since then I’ve found a great website that visually calculates where the moon will rise and where it’s shadow will fall from any point in the world. Visit JekoPhoto. The planetarium told me the compass angle that the moon would rise on during the next several full moon cycles. I had to find a location 20 kilometres (12 Miles), from the city, with a clear line of sight. PHOTOGRILL: Why so far away from the city? PHOTOGRAPHER: To have the moon appear very large in the photo requires a very long focal length. I used a 600mm f4 lens and a 2x teleconverter, so 1200mm focal length. In order to have the city skyline sit at the bottom of the image with that lens you need to be a long way away. I searched by car with compass in hand for most of a day and finally settled on Point Cook Road, west of Melbourne. Just a few years later the view along the whole road was built out with double story housing. The road runs North/South for quite a way so there was plenty of lea-way. For this shot you have to be in exactly the right position before you can even see the glow of the moon rising. Less than a degree out and the moon may not even be in the viewfinder. I thought that if my calculation was slightly off then I could just move up or down the road. Boy was I wrong, From the time I could see the first slither of the moon to the time it left the frame was a few short minutes. I never realised just how fast the earth turns before this. It was an amazingly exhilarating experience watching the huge golden disk rise so quickly behind the city, I almost forgot to take photos at all. I took about six frames in all, and then it was gone from the viewfinder. PHOTOGRAPHER: Camera was a CanonEOS1, with a 600mm f4 lens and 2x teleconverter. Both the camera and the lens had their own tripod attached, just to be sure I wasn’t going to mess it up. A wired remote release was also used so I didn’t have to touch the camera. Exposure was 8 seconds with the lens wide open, equivalent of f8. 800 ISO. This entry was posted on Saturday, February 26th, 2011 at 9:15 am. 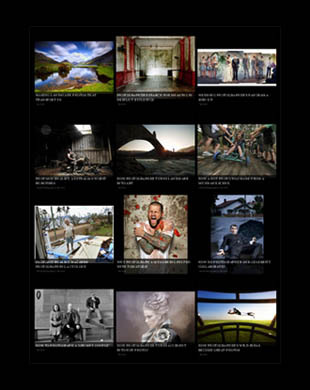 It is filed under Fairfax Photographers, The Grill and tagged with Landscape Photography, Nature Photo, Photographic Techniques, Posts Tagged ‘Landmark Photo’. You can follow any responses to this entry through the RSS 2.0 feed. I saw your post at http://www.photogrill.com/archives/149, nice post. These images are really awesome! I love how the moon is near the buildings! Daddy, you did a really good job on this photo. Your career would be really cool!